Lots of websites install little programs inside Internet Explorer, one of the browsers that comes with Windows 8, to help you navigate the web or to add features to some websites. Not all of those little programs are well behaved. Internet Explorer lets you see a list of all the currently installed little programs, called add-ons. You won’t find any plug-ins in the Windows 8 Start screen’s version of Internet Explorer. No, plug-ins can be installed only in the more full-featured (and hence more trouble-prone) desktop version of Internet Explorer. To see what’s hanging onto your copy of Internet Explorer, click the program’s Tools button and choose Manage Add-ons. 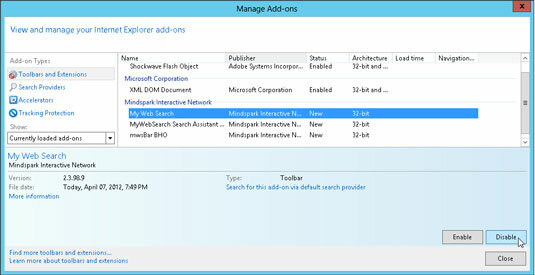 Internet Explorer’s Manage Add-ons window appears, letting you see all add-ons, toolbars, search engines, and more. Most add-ons listed in the Manage Add-ons window are fine. (The ones from Microsoft are generally harmless.) But if you spot an add-on that you don’t recognize or that you think is causing problems, look up its name in Google to see what most people say about it. If you find one that seems bad, click its name and click the Disable button. If disabling the add-on keeps something from working correctly, return to the Manage Add-Ons window, click the add-on’s name, and click the Enable button. Managing add-ons sometimes turns into a game of trial and error, but it’s a handy way to disable a rogue add-on installed by a nasty website.